We are showcasing each of the 12 contenders in the run-up to the Sports Personality of the Year award on 17 December. Today - Bianca Walkden. Secured five successive global titles including heavyweight gold at the World Championships in June. Walkden became the first British taekwondo fighter to win back-to-back world gold medals in defending her title in South Korea and went on to claim Grand Prix victories in London, Moscow, Morocco and Ivory Coast. The Liverpool-born fighter has been beaten only once since claiming bronze at the 2016 Olympics - she missed out on the gold-medal match having lost in a golden-point round. "What Bianca has achieved is absolutely phenomenal, I don't think people outside the sport actually realise it. She's had a long, tough journey with two ACL (anterior cruciate ligament) reconstructions. "She has been stronger then ever before. She's just got bigger and better, mentally and physically. "Bianca is amazing on and off the mat. She is so professional. I see her doing extra weights and extra kicking in training. I see her tired and struggling but she doesn't moan." 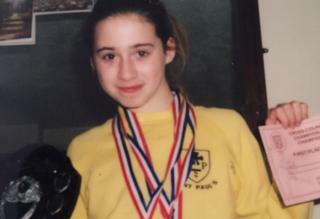 Started taekwondo at 11 when she attended a local club with her best friend and four years later won a bronze medal at the junior European championships. She became the second British athlete, after Sarah Stevenson, to win gold at the World Taekwondo Championships. That 2015 triumph came after recovering from knee surgery and the following year she won her second senior European title. As well as her second world championship triumph, in 2017 Walkden became the first fighter to win all four Grand Prix events in the same year and was named World Taekwondo Athlete of the Year. What she said: "I have the confidence that I'm becoming one of the best and no matter what happens I don't want to give up.."
Simon Grocock: What a way for to round off a truly amazing year. Congratulations Bianca - you get my vote. Well done champ. Sports Personality record: First nomination for taekwondo. Aaron Cook and Jade Jones have previously been shortlisted for the Young Sports Personality award. Korea-inspired taekwondo requires patience, self-discipline, dedicated training - and seriously flexible legs. Visit the Get Inspired website to find out more on how to get into martial arts. This article was originally published on 13 December, 2017.